From left, Kameron Spaulding, Gwen Miller, Colin Toole, and Mayur Desai say the new, 96-room Courtyard by Marriott hotel will open in May. The temperature was in the teens and the wind chill factor was frigid on a recent day when town officials arrived at the construction site of the Brushwood Marriott Hotel in Lenox, but Colin Toole and Mayur Desai wanted photos taken outside the entrance to show off the building’s unusual French empire design. “This is not a prototype of a typical Courtyard Marriott,” Toole explained. But then again, noted the CEO of Toole Co., which owns and will manage the property, and also built and operates the Hampton Inn and Suites in Lenox, the town is no ordinary place. “Lenox has a certain cachet in terms of its name; when people think of it, they think about Shakespeare and Co., the Gilded Age mansions, and Tanglewood,” Toole told BusinessWest. Indeed, those very attractions, combined with bucolic scenery, the town’s identity as a center for health and wellness — it’s home to Canyon Ranch and the Kripalu Center for Yoga and Health — and a wide range of culture and recreational opportunities have spawned a number of multi-million-dollar projects in the last year alone. The largest project in the works is a $60 million expansion and renovation at the former Cranwell Spa & Golf Resort. The Miraval Group, a subsidiary of Hyatt Hotels, purchased the property last fall for $22 million and plans to transform it into a high-end wellness resort. Other major projects taking place include the new Marriott, the relocation of Morrison’s Home Improvement Specialists Inc. from Pittsfield and its adaptive reuse of a blighted building that had been vacant for 10 years, an apartment conversion at the Walker Street Residences by Allegrone, and the construction of its new headquarters and co-working office space using green design and technology in a building on Route 7. “It’s been a good year for investments, which shows that Lenox is a place where people want to do business,” Spaulding said. Economic development and growth is on an upward trajectory, but Town Manager Christopher Ketchen said the town hasn’t rested on its laurels. In February, officials adopted a policy to determine whether a project is worthy of a TIF, or tax-increment financing, which is used as a subsidy to spur redevelopment; or an STA, which stands for special tax assessment. Ketchen added that Lenox has a sound fiscal standing and excellent schools, which play into the equation when developers consider a project or a business wants to move. It is one of two towns west of the Connecticut River that has an AAA rating from Standard & Poor; one of its elementary schools earned a Blue Ribbon rating from the U.S. Dept. of Education, and its high school is the only one in the Berkshires that received a Gold Medal Award from U.S. News & World Report. In addition, its infrastructure improvement budget was $10 million for FY 2016-17, and the town plans to spend another $5 million over the next year. The population in Lenox is aging, which reflects a trend in other towns in the Berkshires, and the median age of residents is 51. But town officials are taking steps to attract young professionals and families. Last year, they created a first-time-homebuyers program in partnership with four banks that offers up to $10,000 in down payments to qualified applicants. They also changed zoning requirements to make it easier to build new apartments and condominiums or convert older housing stock into appealing residences, as well as adopting a Complete Streets policy that will make the town eligible for state funds to improve connectivity for pedestrians and bicyclists. For this issue, BusinessWest looks at major projects that are underway and what they will add to help increase the tourist business that is the cornerstone of the town’s economy. The Miraval buildout of the Cranwell resort will begin this spring and is expected to take two years to complete. A total of 43 new rooms will be added to the existing 105, along with a new spa, fitness center, new programming, and other wellness features. The existing facilities will be renovated, the property will remain open during construction, and neighboring condominiums will be able to access the golf course and other amenities via a fee-based system. “Miraval plans to construct several new buildings and an underground tunnel to connect guests from the main campus to the driving range and several other buildings across the street,” Miller said. Ketchen told BusinessWest that people have been coming to Lenox for generations to find themselves spiritually and improve their lifestyle, and this high-end wellness resort will benefit the town as well as Miraval’s clients, who often fly from New England to their other locations in the Midwest. The project is expected to create more than 100 new full-time positions and generate an estimated $1.3 million annually in real estate, sales, and lodging taxes, in addition to a one-time, $1.1 million payment for sewer, water, and other utility connection fees. The new Brushwood by Marriott will also add to the town’s offerings and is expected to open next month. The hotel will have 92 rooms with panoramic views, an indoor pool, a large patio with firepits, a restaurant, and a 12,000-square-foot event space, which is something Lenox hasn’t been able to offer groups in the past. Planning began in 2013, and construction kicked off last year after a blighted Econolodge building on the site was demolished. “We focused a great deal of attention on making this property unique. 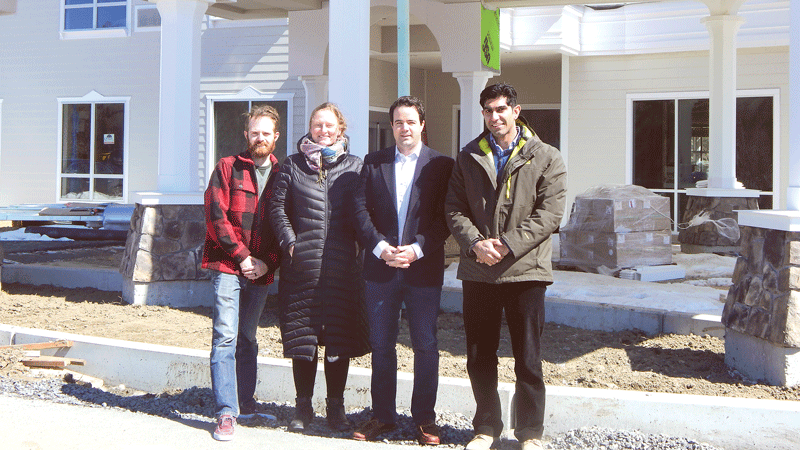 It fills a void in the Berkshires for hospitality,” said Desai, who will serve as general manager and is a partner in Brushwood LLC, which owns the real estate. The work has been undertaken by local contractors, and although Marriott is a branded property, the Lenox hotel will be managed by its owners. Another major project was finished last month and opened its doors April 1. 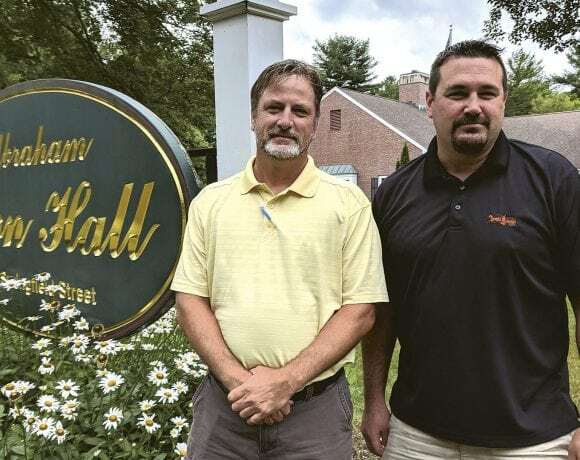 Steve Morrison, who owns Morrison’s Home Improvement Specialists in Pittsfield, relocated his company to Lenox after completing a $400,000 gut and renovation of the former Trillium House on Route 7. He needed room to grow, and the moment he stepped into the 1870 building, he saw its potential in spite of the deterioration that might have scared others away. Today, the building is a welcoming place and resembles a new home inside and out. It has become Morrison’s headquarters, but there are areas that show off every product needed in a residential renovation, filled with samples of roofing, windows, tiles, kitchen cabinets, lighting, bathrooms, floor and wall tile, and more. There is a dearth of market-rate apartments in Lenox, but thanks to Allegrone Companies, the number will soon increase. The firm is undertaking a $5 million to $8 million renovation of the 1804 William Walker House that will transform it into eight market-rate, one- and two-bedroom apartments. The new units will range from 800 to 1,500 square feet and contain dishwashers, security alarms, stainless-steel appliances, and other amenities. The work is expected to be completed this summer, and three of the apartments have already been rented. “The building is within walking distance to downtown, Shakespeare and Company, and Canyon Ranch,” Miller said, adding that they will help fill a need in the community. In addition, Allegrone recently completed the renovation and establishment of the new Berkshire Design Center. The project began almost five years ago when the firm purchased the foreclosed and abandoned Edgewood Motel, which was built in 1959. After a major renovation, Allegrone moved its corporate headquarters from Pittsfield to Lenox into the second floor of the newly built, contemporary, 30,000-square-foot office building on Pittsfield Road last summer. Large window frames align the inner corridors and outer walls, allowing natural light to radiate through the building, and the first floor contains 16 suites and co-working conference and event space that tenants will share. Xerox moved in and staged a ribbon-cutting ceremony several weeks ago, and Liberty Mutual has signed a lease agreement and will become the second tenant. “This renovation was one of only 16 economic-development initiatives across the state during the recession,” Spaulding said, explaining that officials from the town and state Economic Development Incentive Program collaborated with MassDevelopment, which gave Allegrone a multi-million-dollar recovery-zone facility bond to fund the project, then Allegrone worked with local teams of architects, engineers, and field contractors to do the work. The Zoning Board of Appeals has also approved a special permit to open a center for women with eating disorders at the former Lenox Institute of Water Technologies. Members of the Berg family who established 107 Yokun LLC and own the adjoining Ethelwynde Estate plan to hire a company that will use the building to help women who suffer from anorexia and bulimia. It would house up to 48 residents who would live there for several months while undergoing treatment, and promises to create 25 full-time jobs. “It dovetails into the broader health and wellness movement stemming from nearby Canyon Ranch and Kripalu, as well as the recreational opportunities here, and is an interesting example of a private adaptive reuse of a building on a historic site that leverages other development in our community,” Miller said, explaining that the town has a ‘great estates’ bylaw intended to promote this type of reuse. In addition, to encourage companies to move to Lenox or expand, town officials have been focused on a five-year open-space plan that was adopted in 2013 to serve the community as well as the visitor population. “Open space is a large part of our identity,” Ketchen said, as he spoke about the town’s great-estate legacy and expanses of open space around these historic buildings. Officials are working with partners to capitalize on the town-owned land at Kennedy Park and a future boardwalk with access to Parson’s Marsh, which is a wetlands area that is home to many birds. In addition, Berkshire Natural Resource Council, the regional land trust, is working toward a regional trail network with a long section passing through Lenox, and construction is about to begin to improve the town beach on Laurel Lake. Lifeguard hours will be expanded this summer, the area will become handicapped-accessible, and changes will be made to the beach house that contains bathrooms and changing areas. The fact that Lenox is a small town has helped facilitate development because officials know what properties are available for development as well as their history. “I’ve spent entire days driving people around to look at sites, and several hours on Sundays,” Spaulding said. Miller has done the same and will continue to extend that courtesy to people interested in building or moving to the town. Ketchen agreed and said the end result is the continued popularity of the town as a destination.